Recently, I had the unfortunate experience of dealing with criticism. I was told (not to my face) by a visitor to our school that our library makerspace is not a “real makerspace”. This same person stated that our woodshop is a “real makerspace” because it has power tools. She suggested that I “do some research” on what makerspaces actually are. Feeling personally insulted aside, what bothers me most about this statement is the concept that some makerspaces are more valid than others and that a makerspace is solely defined by the tools it contains. I do agree that our woodshop is a makerspace, even though we don’t call it that. Our woodshop is awesome, and I’m so glad that we have a space where students can learn how to use saws, drills and other tools to build awesome projects as part of their curriculum. 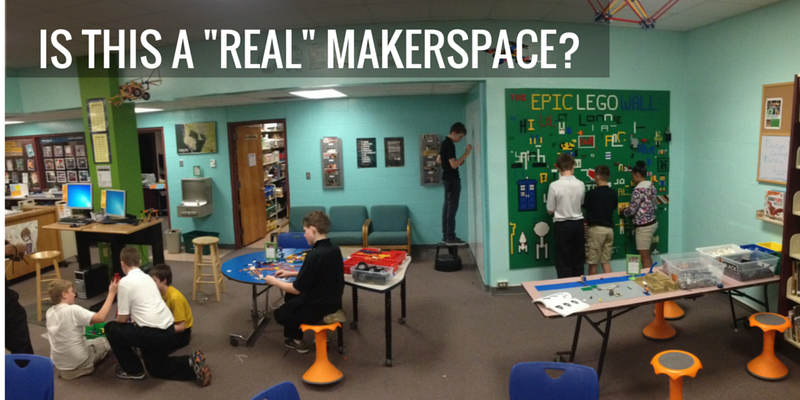 Yes, that is a makerspace. But is my space any less of a makerspace simply because it doesn’t have power tools? Because it doesn’t have a 3D printer? Because my students build with LEGOs, K’nex and cardboard? 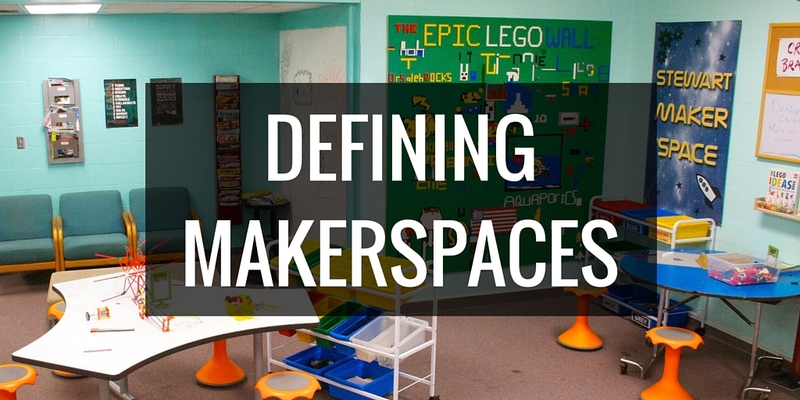 All of this got me thinking about how we define “makerspace”. So I did what librarians do best: I researched. I gathered together my books on makerspaces, I searched our databases for articles, and I crowdsourced the amazing hive mind of Twitter. A makerspace can be anything from a repurposed bookcart filled with arts and crafts supplies to a table in a corner set out with LEGOs to a full blown fab lab with 3D printers, laser cutters, and handtools. 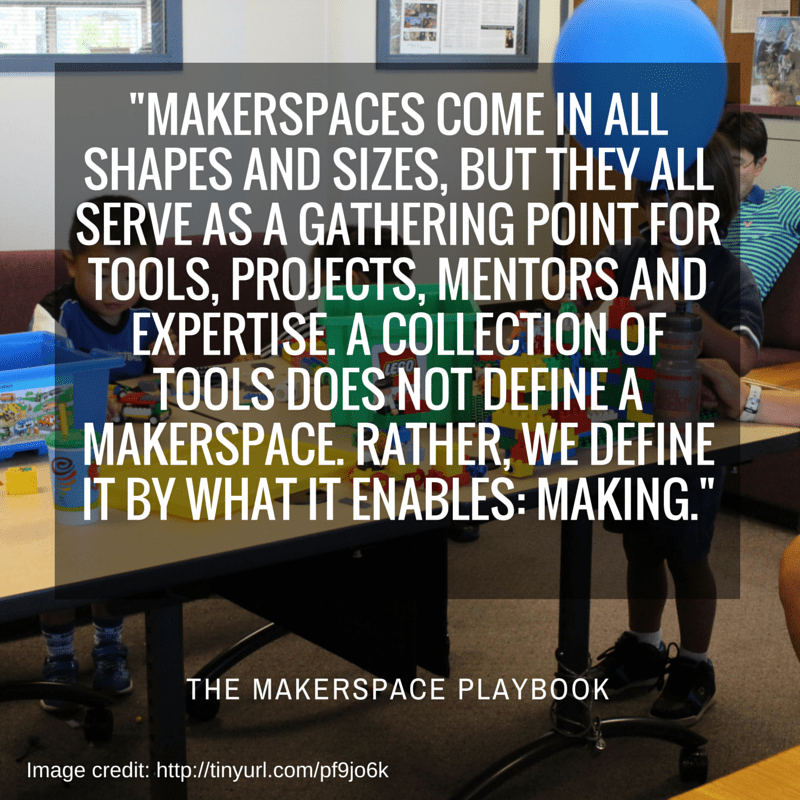 No two school makerspaces are exactly alike, nor should they be. 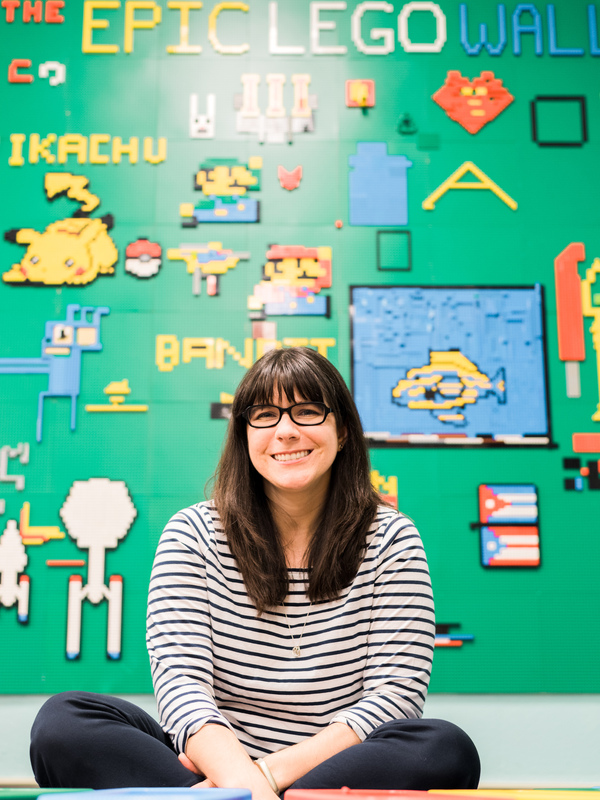 Makerspaces are as unique as the school cultures they represent. There is no such thing as one form of making being more valid or better than the other. Makers are artists, crafters, knitters, seamstresses, builders, programmers, engineers, hackers, painters, woodworkers, tinkerers, inventors, bakers, graphic designers and more. The video above is really long by internet standards. But you should at least watch the first few minutes, where students share what their makerspace means to them. Check out my Makerspace Resources page for more links, articles, videos and book recommendations. You are spot on Diana! 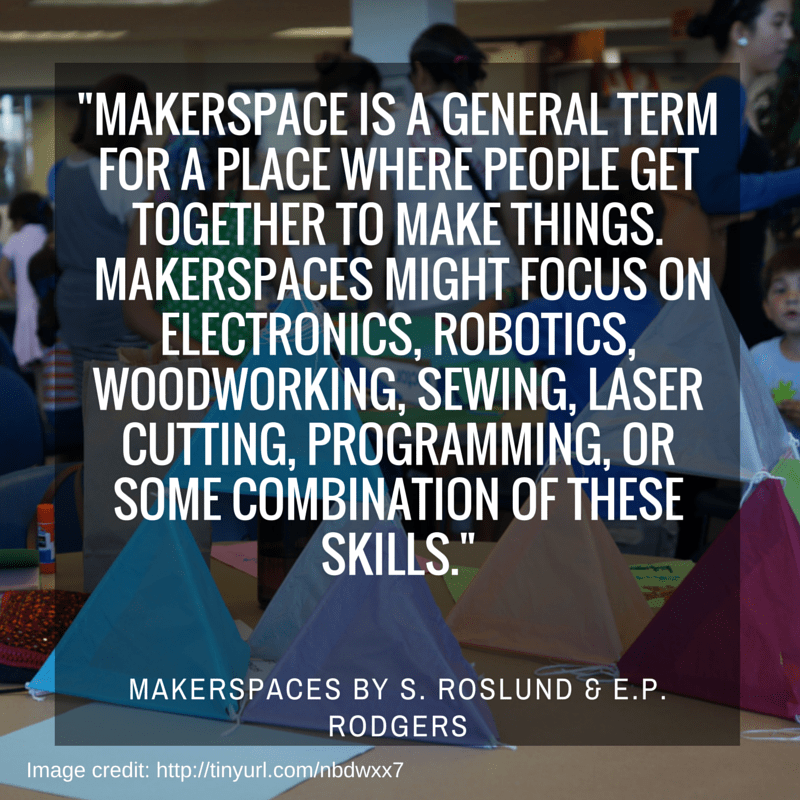 A Makerspace can be anything, anywhere, any time – so long as it includes people, a place and making! I’ve tweeted you a pic of our Makerspace – which is still in progress, and doesn’t have much more than cardboard and some LittleBits kits right now. We also have only rolled out the idea of Makerspace to 5th graders at this time, but for them, it has become a vital part of our school. In the tweet, I also included a copy of a Google Doc that 2 of my struggling fifth grade boys created. It explains, in their words, why Makerspace is so important. Keep up the good fight! Very timely, and you are exactly right! Not tools; opportunities and possibilities. I’m pooling resources for a presentation to my state library association, and I’ve been pondering the exact same thing. 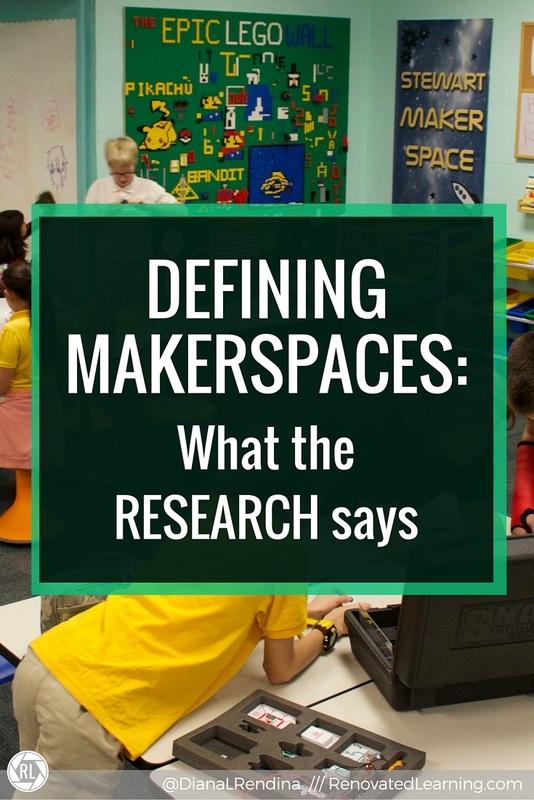 The definition I’m using in the presentation is “a space where students create,” followed by some examples from my elementary makerspace. I would even suggest that the “space” can be at home via a circulating kit with reusable supplies. Thank you so much for explaining that maker space is a concept beyond tools and tech. I had a similar experience with an ignorant woman who barged in and was very vocal in her criticism. It was jarring to say the least. You are courageous to do everything you can with everything you have. Too bad she didn’t do her research, look at your budget or offer her encouragement and support! Your students are so lucky to have you; I’m sure they know it and that is all that matters! Thank you , Diana! I am toying with the idea of a Maker Space in my library. I am intimidated that mine won’t be considered “good enough” or “real” if it does not include computers, coding or robotics. Our computer lab already does those things very well! My library is also a completely open space so security is also an issue. You gathered some great info that I will use as I start to put together my space. Now I am considering a Maker Space cart that could be rolled in and opened during classes. THANK YOU! We are going the MakerSpace cart route this fall. Don’t have the space in the library but we want to make the resources available for our teachers to create in their classrooms. I’m putting together a Makerspace, and my first phase will be all paper construction– and ecofriendly at that because I don’t want markers and plastic!